A motorcyclist is dead after police say he slammed into a car at 100 mph. 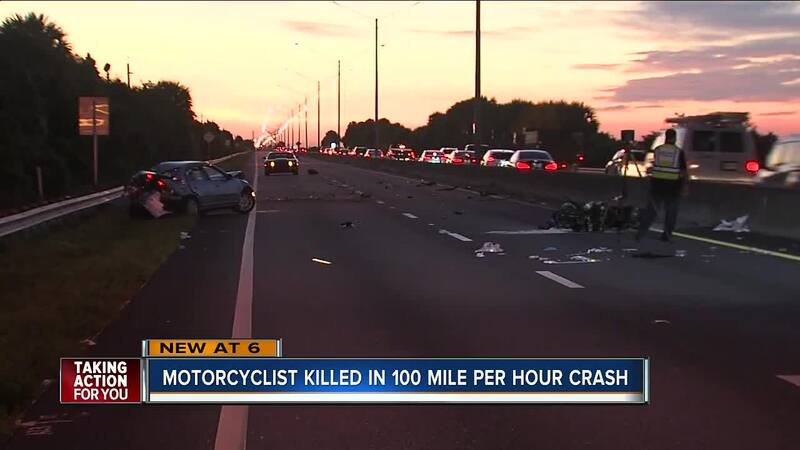 CLEARWATER, Fla. — A motorcyclist is dead after police say he slammed into a car at 100 mph. In keeping with our commitment to Drive Tampa Bay Forward, we've reported on close calls on the Courtney Campbell Causeway because of racing, speeding and other dangerous behaviors. However, this morning it turned deadly. Mangled metal and debris were left scattered across the causeway after the cash. "Really bad crash the worst I've seen," said Valentin Sifuentes. This morning, Sifuentes is still holding onto a safety pin. It's from the fire extinguisher he used on the burning motorcycle. Sifuentes tells ABC Action News he changed lanes to get out of the path of the speeding bike behind him. Clearwater police say 29-year-old Nathaniel Varnadore was driving triple-digit speeds when he crashed into the back of a Honda Civic. Varnadore died and the Civic's driver was sent to the hospital and later discharged. Sifuentes says moments before the crash he knew something was off. "I just seen the headlights coming and just the vibration of it... the beam... I knew he was at high speed," he described. This continues a trend of dangerous driving on the causeway. This month, police arrested three men for racing. The week before that they caught a man going 127 mph. In August, three officers were hurt after a driver failed to move-over and slammed into a cruiser. Clearwater Police is responding to the issue. Following the police cruiser crash, they conducted a move-over operation where they wrote 42 citations. Most recently they did a crackdown targeting speeding and racing. From August 1 to today, they've issued 84 citations:12 for racing, 20 for speeding, and 29 for refusing to move over. "I see it all the time. Me working nightshift, especially coming home," said Sifuentes. He's pleading for drivers to just follow the law. Clearwater PD says they are planning future, similar crackdowns on the Causeway to combat this problem.